Is Joe going to go? 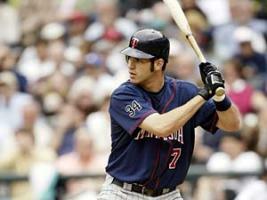 Is Joe Mauer like Kevin Garnett? It’s one of the questions that was impossible to ignore while watching Garnett fillet the Minnesota Timberwolves last night. Garnett, the best in the business, was paid a ton of money to stay and play basketball in flyover country. But then he tired of not winning championships because there wasn’t much money left for the team to spend on other players that might accomplish that. Last night, of course, the New York Yankees won the World Series and as Yankee catcher Jorge Posada was interviewed afterwards, it was impossible to ignore the fact that (a) he’s old and (b) he’s old and (c) Joe Mauer of the Minnesota Twins isn’t. The Twins will be rolling in cash, thanks to the new stadium that taxpayers paid for with the assurances that it would help the team remain competitive with the likes of the New York Yankees. Why we believed any team can remain competitive with the New York Yankees is a story for another day, but Minnesotans are possibly about to go through what hopeful fans in Cleveland — the long goodbye. Mauer’s contract with the Twins ends next year. Because he’s the best in the business, he’ll get — as Garnett did — a pile of of cash to stay, unless it becomes obvious that won’t leave the Twins with enough money to surround him with good players in which case — and in consideration of his age — he may want to go off to New York to win a World Series. When dealing with an unprecedented, unparalleled talent like Mauer, the best strategy is to lock him down long-term, as soon as possible, no matter what the price. Mauer might cost the Twins a lot now, but it’ll cost them even more to lose him to Boston or New York. The open market is a scary proposition. Unless the Twins have a death wish, re-signing Mauer should be a top priority for the Twins’ front office this offseason. And according to MLB.com’s Twins beat writer Kelly Thesier, it is. If a deal can’t be reached, Joe may never play in the House That Joe Built. Baseball teams are now trading their free agents a full year before their contracts expire. Newer › Was Flight 188 out of radio contact for three hours? Probably not. Mid-market teams have increasing pressure to retain high profile players – regardless of the sport. This case is increasingly sensitive as for many Minnesotan’s, Joe is a home grown talent. He is one of us. That being said, a front office cannot invest a significant amount of capital in one asset and expect to good ROI. The Twins pride themselves on farm-raised talent and the low-cost contracts that those players come with. But when that talent is recognized across the league, lucrative contracts are offerred from major market teams with the balance sheets to support a roster for of Joe’s. When Santana made the move to New York, I think the fan base recognized that Blackburn, Slowey, and company could help offset that loss in the rotation. But, for a home town superstar with 3 Batting titles and potentially a 2009 MVP award, a lot more then financial investment is at stake. The other part being a State’s pride. Mauer like Kevin Garnett is loyal to his team and the fans. Almost to a fault they will believe their team can improve and one day hoist the championship trophy. The Twins absolutely need to add similarly talent players to the team in order for us to compete with the Angel, Yankees, Boston etc. We cannot always be the scrappy team that pulls out a handful of playoff wins but in the end are taken out by the more talented team. If Joe Mauer can take anything away from the KG deal in the past, he would be wary to sign a contract longer than 5 years with the Twins. If the Twins do not win a championship or come very close before Mauer hits 31-32 years old, he will seek his fortunes else where. No one will begrudge him in his pursuit of the one jewel that will complete his career. Team like the Yankees will accept him with open arms, add him to their already impressive arsenal of talent, and 172+ games later he will have his ring. I love Minnesota sports but in the end, they only break our spirits. Um…” as he’s made it clear that winning is high on his priority list.” I know what Kelly meant by writing that, but come on…isn’t winning on ALL major league sports players priority list? I guess one thing I’m happy about is that it seems like Mauer (and others) have started to speak up from time to time about the desire to make it past the 1st round of the playoffs. I know it’s not his place to run/manage the team, but by speaking up at least management has a chance to listen. Here’s hoping the Twins bring a great team to Target Field next year!! A comment by Justin Morneau was telling. He said that he and his good friend Joe already have “all the money they will ever need”. Along with the comments they have made about winning being “high on the priority list”, I think the take away message to management and fans is this. They both prefer to stay here, even at a discount, but they want to feel like they have a chance to win a World Series before it’s all over. If the Twins let Joe get away, the fans will not forget for a long time.